Let's begin with a little personal history. Back in 2008, I decided to get into the blogging scene by jumping on board the latest MMO hotness -- in this case, Warhammer Online. As I was growing increasingly tired of World of Warcraft, WAR seemed to offer a refreshing alternative: a darker world full of brutal PvP and awesome new ideas. So I joined the elite ranks of bloggers (hey, stop laughing so hard) and spent the better part of two years jawing about Mythic's latest fantasy project. And while Warhammer Online was, in my opinion, a solid product, it certainly failed to live up to the extremely high expectations held by both the development team and the players. No matter how it turned out, I really enjoyed talking about WAR, especially in the days leading up to its launch. One of the first articles I ever wrote for my blog WAAAGH! dealt with the first attempt to bring Warhammer Online into the MMO genre (as a fun aside, it was one of the first times I got my name on Massively!). It's a "what if?" tale that's tantalizing to consider -- an entirely different studio, Climax Online, creating a much darker version of Warhammer than we've ever seen online. The tale of the game's rise and fall (and subsequent rise and fall again) captivated me, and I wanted to expand my old article as part of our recent series into exploring MMOs canceled before their launch. So what if Climax had brought Warhammer Online to bear? Would it have eclipsed Mythic's vision or been its own animal? Hit the jump and let's dive into the pages of ancient history! Before Mythic ever laid a finger on Warhammer, before Paul Barnett bought those hideously awesome sunglasses, before "War is Everywhere," there was another company already hard at work on an online Warhammer presence. Its name? Climax Online. Climax formed in 1988, and began to seriously publish games in the PlayStation era. Today it's still trucking along with various low-profile titles under the moniker of Climax Group. You might recognize them as the makers of Silent Hill: Shattered Memories and Overlord: Dark Legend. As early as 2000, Climax spied the Warhammer IP as a project worthy of its interest and efforts. Despite having no experience in the burgeoning field of online RPGs, Climax engaged the project fully and built up some buzz through E3 videos and limited press. An early partnership with Microsoft helped to build up the back-end technology. By 2002, Climax joined to work hand-in-hand with Games Workshop in order to transform one of their most recognizable IPs into a hit MMO, and with SEGA distributing the game, they named the venture "Warhammer Online Ltd."
One of the most notable features of Climax's Warhammer -- and what it will be remembered for -- was an intense, unrelentingly dark atmosphere -- almost grim, as some described it. 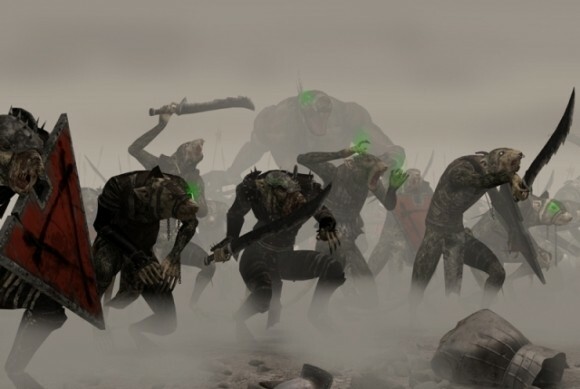 In an interview with GameZone, Climax touted this approach with glee: "Warhammer aims at a grittier realism where the downtrodden peasantry is suitably terrified of the monsters that really do go bump in the night (mainly when they drop the bodies they've been carrying)." Playable races announced included Humans, Elves, Dwarfs, Halflings and Ogres. Four starting classes were also released: Warrior, Academic, Rogue and Adventurer. Guilds would be called "Warrior Companies," and clothing and armor would be independent graphical layers that would go on top of your character's model versus the standard "reskinning" the basic character model that was standard at the time. It was stated that the large game world (set in the Reikland) would take around 12 to 14 hours to walk its seamless 400 kilometers end-to-end. 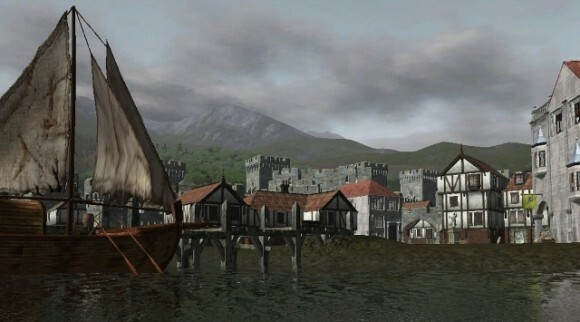 Along the way, players would find three cities, 12 towns, 30 villages, 30 farmsteads, 18 coaching inns, 15 dungeons and other various landmarks to explore. The game world's look skewed to the more realistic than stylistic, saturated with dark and muted tones. Weather effects were planned along with seasons, including snowfall that would actually accumulate over time and other effects that would affect combat. This world wouldn't be predictable, either. Enemies would roam randomly, and if left unchecked, would start to congregate in even greater numbers and potentially build NPC camps. Noise was made by Climax about getting away from level-based advancement toward a more skill-based system. The idea here was that you would earn reputation with a certain group and then join them to learn what career skills they could teach (including non-combat abilities). Careers were lumped into various tiers that represented the power and difficulty level of the skills. You could easily learn Career 1 skills, but you had to jump through a lot of hoops to access Career 2, and so on. Once you accumulated a certain set of skills, you would find yourself fitting into a class of sorts. A Master Assassin required beggar, ruffian and herbalist skills, among others. The higher you went in the career tiers, the more you became flagged for PvP to members of opposing career sets. As far as I can tell, this type of PvP flagging would not be optional but integrated. While several locale names -- like the city of Altdorf -- might be familiar to today's WAR crowd, Climax's game seems almost radically different from what we've ended up with now. The planned server sizes would be relatively tiny (4000 to 6000 in population), voice acting non-existent, inventory would consider weight as a factor, combat would be round-based (not real time) to compensate for slower internet connections, trading between various NPC vendors would be a viable way to make a buck, and GMs would stage numerous live events such as invasions. Interestingly enough, Climax's Warhammer would have come replete with an in-game journal that would record every quest undertaken, every mob killed, atlases and so forth -- a precursor to Mythic's famous Tome of Knowledge, perhaps? As the world of Warhammer was deeply suspicious of magic -- almost anti-magic, in fact -- the magic system in Warhammer Online would be altered from most traditional fantasy MMO models. Each zone would have a certain magical attunement, resulting in varying streams of magical energy that players could draw on for their diabolical spells. What might be easy to cast in one area would be almost impossible in another, depending on the spell in question. "We want to assure fans that we won't be rushed in this, and we won't release a game that does not meet all the strict quality criteria we place upon ourselves and placed upon us by the guys at Games Workshop." The Climax team, who received a nice boost in profile at E3 2003, struggled to show something -- anything -- new at E3 just a year later. Battles between Climax and Games Workshop about the art and animation were cited as a major holdup. It quickly became obvious that Climax bit off more than it could program, and planned features were scaled back or cut altogether. By June of 2004, Games Workshop took an inventory of the project, which they estimated would take $30 million to finish and launch (in comparison, Star Wars Galaxies took $30 million to fully develop and World of Warcraft $60 million). The company deemed it to be too expensive and stopped funding the project. 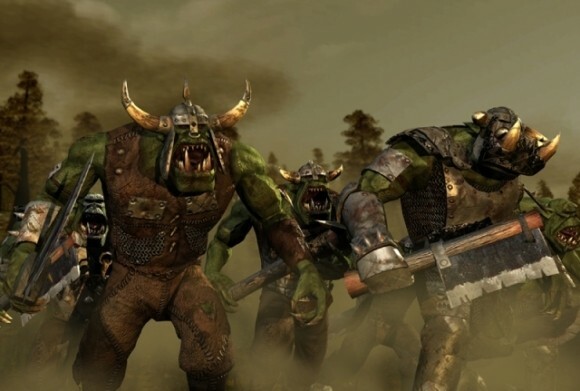 This didn't fully kill Warhammer Online, however, as Climax continued to fund the project out of their own pockets and struggled to find a publishing partner. Unfortunately for them it didn't happen, and Climax's Warhammer project was officially canceled for good by the end of the year. Climax's CEO, Karl Jeffery, expressed regret about the decision: "It was a deeply sad thing for us to have to do after so much hard work and commitment from the entire team." "It is with a great deal of sadness that I inform the community that we have decided to discontinue the development of Warhammer Online and will be closing down this website with immediate effect. This has been a difficult and painful decision but it was taken following a full review of the progress of the game, costs to date and future costs of the project. As a result both Games Workshop and Climax Development Limited, the computer games developer, have agreed to terminate the development project. I would like to say a personal thanks to all of the people who have followed our development over the last few years, your constant support and enthusiasm has meant a great deal to us." About five months later, Mythic Entertainment snapped up the license. Instead of building off of Climax's efforts, the team decided to start over on the entire project, creating their own vision of the Warhammer world. This game would ultimately become Warhammer Online: Age of Reckoning, and released in 2008. It's hard to say if Climax's version would've been successful, as we don't have much in the way of player testimonies or in-game footage to analyze. I certainly like some of the ambitions behind the project and the more open-form character development, but Mythic definitely made the better-looking game, and probably the more user-friendly one as well.